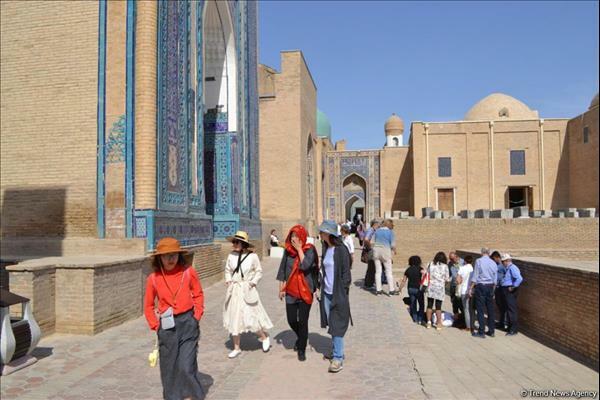 The inflow of foreign tourists into Uzbekistan has increased by 2.3 times from 2.8 million to 6.4 million people in 2018, Trend reports via the State Statistics Committee of Uzbekistan. The number of men among foreign citizens was 53.1 percent or 3,413,300 people and women was 46.9 percent or 3,019,600 people. Speaking of outgoing tourism, the amount of Uzbeks who left the country also increased by 2.0 times over the past two years: from 6.8 million people in 2017 to 13.8 million people in 2018. The number of Uzbek citizens who left the country was represented by the ratio men - 57.8 percent (8,002,600 people) and women - 42.2 percent (5,836,000 people). The amount of foreign citizens arriving in Uzbekistan from the CIS countries amounted to 6,015,900 people which is 93.5 percent of total number and from non-CIS countries 417,100 people (6.5 percent of total number). There were 13,308,000 Uzbeks who visited CIS which accounted for 96.2 percent of total number and 530,600 people who travelled to non-CIS countries (3.8 percent of total number). The biggest flow of foreign citizens into the country was noted from such countries as Kazakhstan - 2,456,900 people (38.2 percent of total number), Tajikistan - 1,700,700 (26.4 percent), Kyrgyzstan 1,101,500 (17.1 percent), Russia 460,200 (7.2 percent). The biggest flow of people among foreign countries was observed from Turkey 74,800 people or 1.2 percent, China 37,100 or 0.6 percent, South Korea 32,700 or 0.5 percent. The biggest share of Uzbek citizens who went beyond its borders to the CIS countries was recorded in such states as Kazakhstan - 51.6 percent or 7199.8 thousand people, Kyrgyzstan - 23.1 percent or 3196.8 thousand and Russia - 8, 5 percent or 1178.7 thousand. In foreign countries, the largest outflow was observed in South Korea (79,700 people), China, USA, Germany, etc. The main goal for the largest part of foreign citizens who entered Uzbekistan is visiting relatives (73.2 percent). The smallest share of the foreigners have accounted for such purposes as tourism - 7.1 percent, treatment - 0.8 percent, work - 0.6 percent and study - 0.2 percent. The biggest amount of Uzbeks who went beyond its borders was pursuing the goal to visit relatives - 57.6 percent; the least amount was for tourism - 2.9 percent, study - 0.8 percent, treatment and service - 0.4 percent.